Make all your Orlando vacation dreams come true year after year with the timeshare accommodations at the Hilton Grand Vacations Tuscany Village. Find timeshare resales and rentals at the resort priced up to 70% below retail today. 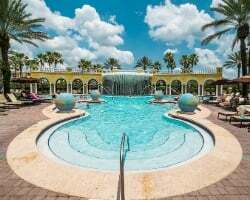 Formerly known as Hilton Grand Vacations Suites on International Drive, this luxury resort in the heart of Orlando will provide you with an unforgettable experience each and every year. Noted for its classic and unique Italian-inspired design, the Hilton Grand Vacations Club at Tuscany Village incorporates modern accommodations with thoughtful amenities to create a complete vacation for each and every guest. From its two lavish swimming pools to the signature Toscana Pool Bar and Grill, you'll have everything you need to enjoy your trip to Orlando. The accommodations at the HGVC at Tuscany Village range from simple studios to spacious two bedroom suites, perfect for couples, families, and small groups alike. With contemporary furnishings and up-to-date in-room amenities like private balconies, full kitchens, and laundry machines, you'll truly have a home-away-from-home in Orlando. Enjoy the jetted tub in your master bath with a glass of wine, or prepare your own meals for family dinners in your dining room—regardless of how you want to spend your vacation, you can do it comfortably and conveniently from the Hilton Tuscany Village. Do you want to learn more about how you can lock down these amazing accommodations each and every year? 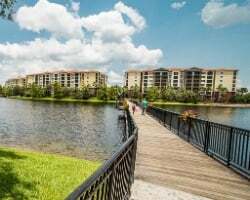 Fill out the form on this page for more information on becoming a timeshare owner at the Hilton Tuscany Village Orlando, or call a representative directly at 1-877-815-4227 today. Purchasing a timeshare resale enables vacationers like you to enjoy all the perks of timeshare ownership each and every year on your excursions. However, it also allows you to secure those privileges more affordably than most. Since timeshare resales at the Tuscany Village resort are offered by current timeshare owners, prices tend to be much more affordable. In fact, it's common to find resale advertisements priced up to 70% lower than retail value on the secondary market, allowing you to save big on the accommodations you want. Resales at the Hilton Grand Vacations Tuscany Village come in a variety of ownership intervals, including deeded weeks, floating weeks, and HGVC points. With no shortage of options to choose from, you can find an ownership interval and a price point that is right for you. What's more, timeshares at the resort fall within Hilton's Gold, Platinum, and Holiday seasons, and are eligible for HHonors rewards, Hilton's loyalty program. The Tuscany Resort Orlando is a part of the Hilton Grand Vacations Club, one of the most resale-friendly timeshare programs in the world. As a timeshare resale owner, you won't be able to enroll in the club at the Elite level, but you will be able to take advantage of a vast array of other exclusive perks and benefits. You can make reservations using Hilton points at the Tuscany Village resort, explore internal exchange options at other Hilton properties, and convert your unused HGVC points into HHonors points to redeem in-room extras and exclusive services. The Hilton Grand Vacations Club at Tuscany Village is also affiliated with RCI, the world's largest timeshare exchange company. 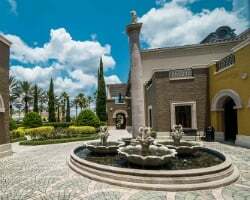 Timeshare exchange can help you get the most out of your Tuscany Village timeshare resale, allowing you to trade your Orlando accommodations for stays at other resorts all over the world. With a separate RCI membership, you can explore vacation possibilities in other destinations like Las Vegas, Paris, or Hawaii, and potentially unlock alternative vacation options using RCI Points. The Hilton Tuscany Village is also an RCI Gold Crown Resort, noted for its superior accommodations and on-site amenities. 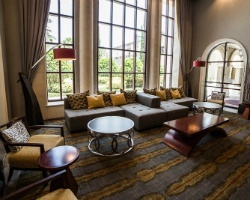 The Hilton Tuscany Village Orlando employs a wide variety of on-site amenities and features designed to truly enhance the experience of each and every guest. The resort's two swimming pools are complemented beautifully by whirlpool spas and a children's interactive water feature, providing ample fun in the Florida sun. The Laguna Snack Bar and Toscana Pool Bar and Grill both provide great places to grab a bite to eat or a cold craft cocktail for lazy days by the pool. The resort's fitness center, basketball court, and tennis courts will appeal to those looking to stay on top of their exercise goals, while the shuttle service is perfect for families heading to theme parks. Nearby, the Orlando area is filled to the brim with things to do and see. Many staying at the Hilton Tuscany Village are likely in Orlando for Walt Disney World, Universal Studios, or SeaWorld—all three parks are located within minutes of the resort, thanks to its impeccable location. Shoppers cannot pass up the Orlando Premium Outlets or Disney Springs, both of which provide amazing shops with one-of-a-kind merchandise. Golfers can easily travel to the nearby Villas of Grand Cypress golf course, which spans 27 holes along pristine Central Florida grounds. Already Own at Hilton Grand Vacations Club at Tuscany Village?